Description: Power On Energizer is the storage center for molecularization processing. 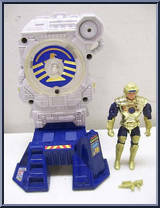 Directly tied to the Powersuits utilized by Captain Power and his Soldiers of the Future, this Energizer System is prototypical and no other such unit exists. Molecular-reforming characteristics are not understood in entirety at this time. Unit was designed by Dr. Stuart Power. Its full power is not known. Systems Engineering: Exact configuration of system is not known presently. Intelligence believes the main system makes use of combined solar and molecular re-structuring for energy generation. 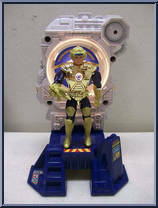 Interactive components utilized in "power on" sequence for molecular formation of powersuits remains unknown. Defensive Systems: Unknown at this time. Current Status: Unit is housed within the Para-Military Complex known as The POWER BASE. Location remains unknown to the Empire at this time. All Bio Dreads are programmed to seek and destroy this rebel fortress. Information on the location of The Power Base, or on The Power On Energizer is to be transmitted to Lord Dread without fail. Warning: Power On Energizer contains both Solar and Molecular Re-structuring Generation Systems. Concentrated configurations of such energy would provide beams more powerful than known laser, ion and proton systems. ALL CLASSES OF BIO DREADS SHOULD TREAT ANY SIGHTING WITH EXTREME CAUTION AND WITH FULL DEFENSE SYSTEMS OPERATIVE. Contribute pictures, update details or suggest corrections for Power on Energizer. Write a review about Power on Energizer.